As you would expect from Ravensburger, the components are top quality. The octagonal board shows the market-place in Asara with different areas for the tower sections, a building circle where you hire workers to build the towers, a bank from which to gain more money, a house of spies and the Caliph’s residence. The tower pieces and money are sturdy cardboard tokens and each player has a cardboard screen behind which to hide their money and tower sections. There are 45 cards which depict the buyers and these come in five colours. Finally there are wooden score and round markers along with the rules and a separate set-up sheet. The gameplay is very straightforward. Each player receives nine buyer cards and twenty coins at the start of each of the four rounds (slightly more in the first round for those not in first place in turn order). On a player’s turn, they lay a card into one area of the marketplace and execute the action associated with that area. Play then moves on to the next person in clockwise order and continues until everyone has used all their buyer cards. That ends the round and victory points are awarded. If the card played is the first in a particular area, it can be any colour of the player’s choosing. However, subsequent cards in that area have to match the colour first played or you have to play two cards of any colour (which then reduces the number of actions you can do in a round as you’re left with fewer cards). Having played a card, you then carry out the action for the area in which the card was played. There are four tower areas from which to purchase tower sections. These are for bases, mid-sections, windows and turrets and the sections come in five different colours. The player selects which coloured section they wish to purchase, pay the cost in coins and place it behind their screen. The next area is the building circle. Here you pay between one and seven coins to hire workers to build your towers, one worker/coin for each section you wish to build. Towers have to have one base and one turret but can have any number of mid-sections and windows, and all sections have to be the same colour. If you are running low on coins, you can go to the bank area to raise more cash. First to visit the bank will get 12 coins, next 10 coins then 8 and any further visitors receive only five coins. You can also visit the House of Spies area. This allows you to bribe an official with 3 or 5 coins and you can then pick and pay for any tower section of your choice. The final area is the Caliph’s residence and going here gives you the Caliph’s patronage token, which makes you the start player for the next round and also rewards the owner with a victory point at the end of the round. Once all players have used all their buyer cards, the round ends and there is a scoring phase. Each tower a player has built gives them one victory point; certain tower sections are marked with gold ornaments and each one of these earns one victory point; and the Caliph’s patronage yields the owner a victory point. The game then moves on to the next round. After the fourth round scoring, the game ends and a final evaluation takes place. Points are then awarded for the highest and second-highest towers in each colour; the highest and second-highest towers overall; the largest and second-largest number of towers overall; and for each remaining ten coins a player has. Whoever has accumulated the most points is then the winner. 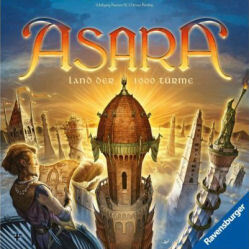 Asara is a very enjoyable family game that is easy to learn, easy to play but has enough to think about to reward good play. I very much like the rule about cards needing to follow the colour first played in an area, as this gives some tactical opportunities to use colours you are strong in to select the more lucrative areas and make it more expensive for those who don’t have that colour. It isn’t going to suit gamers who like a lot of complexity, although it does come with additional rules to add two further elements to the game play. However, it isn’t meant to be a heavy game and is definitely aimed at those who like lighter stuff. The two-player version works well enough although there is less competition for space in the market-place so it is not quite as tense as with more players. With three or four, you really need to prioritise the order in which you visit the different areas in case a vital piece you needed has already been taken. All in all, I would definitely recommend this is an elegant and straightforward game suitable for families and game groups looking for a lighter sixty minute game. The fact that it was nominated for the German game of the year in 2011 is unsurprising because it is a very strong design and looks beautiful.